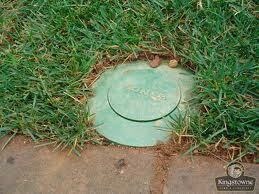 CMG Sprinklers and Drains installs all types of Drainage Systems and French Drains. 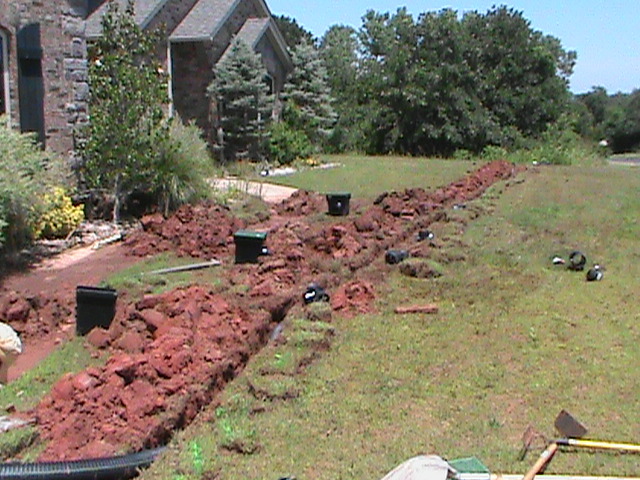 French Drain Installation is a primary focus for CMG Sprinklers and Drains. Angie’s List has awarded us their Customer Service Award for the State of Oklahoma for top quality French Drain Installation. Along with the French Drain Customer Service Award, Angie’s List has given CMG their top A+ Rating and placed us at the top of their website for Oklahoma French Drain Installation. When we run Drain Pipe across yards to an Exit Point, the sod usually can be put back into place and in a few days you can’t tell a French Drain was ever Installed. Sometimes Surface Drains make more sense when the Drainage Problem area is fairly small with Surface Water Flowing into it. 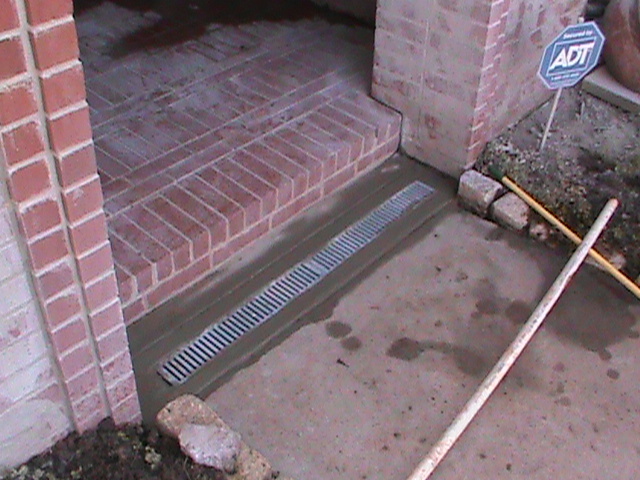 Channel Drains are one kind of Surface Drain that we install in concrete. Pop Up Emitters can release water from Surface Drains or French Drains. They can release water on to sidewalks or driveways, or out in the middle of yards. A Surface Drain is also used as an Intake point. A Surface Drain is a basin with a square or round grate on top. 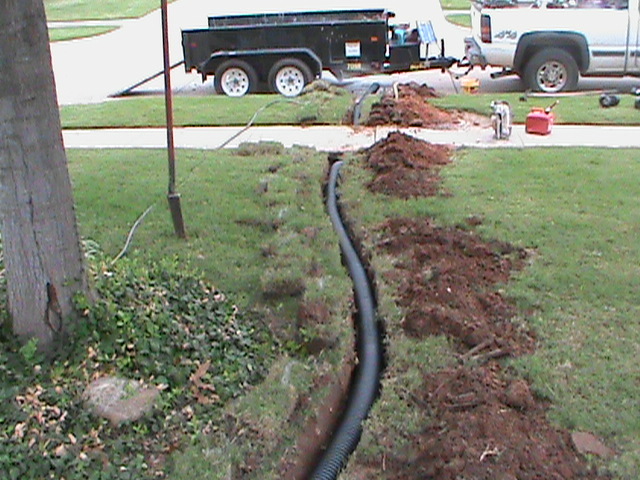 The Drain Pipe that is connected to the Surface Drain or French Drain begins the Transition stage. Simply put, for water to get into a Drainage System, it must pass through either a French Drain or a Surface Drain. A French Drain is designed to handle large amounts of water over a large area. A Surface Drain is designed to handle smaller amounts or water that is more centralized in a smaller area. A French Drain takes in Surface Water and Sub-Surface Water(water flowing underground). A Surface Drain can only take in Surface Water on top of the ground. The Transition Stage is where water travels out of the French Drain or Surface Drain and into a Solid Drain Pipe. The Solid Drain Pipe takes the water to an Exit point or another Problem Drainage Area. Several French Drains or Surface Drains can be connected in any combination. This is determined by the needs of the next Problem Drainage Area that is farther down the hill. The limiting factor is the size of the Drain Pipe between Drains. The greater the number of Drains that are connected together, the larger the Solid Drain Pipe must be between them. Surface Drains induct small amounts of water into the Drainage System. If you have a large 6 inch Drain Pipe, many Surface Drains can be connected together on their way to the exit point. French Drains Take In larger amounts of water faster. As a result, only a Few French Drains can be connected together on their way to the exit point. French Drains and Surface Drains can also be connected together by one Drain Pipe. Once water leaves the French Drain or Surface Drain, it runs through the solid Drain Pipe (The Transitions) to the Exit Point. Water is released through two types of Exit Points. They are the Pop-Up Emitter and the Curb Fitting. A Pop-Up Emitter can be in any good open area. 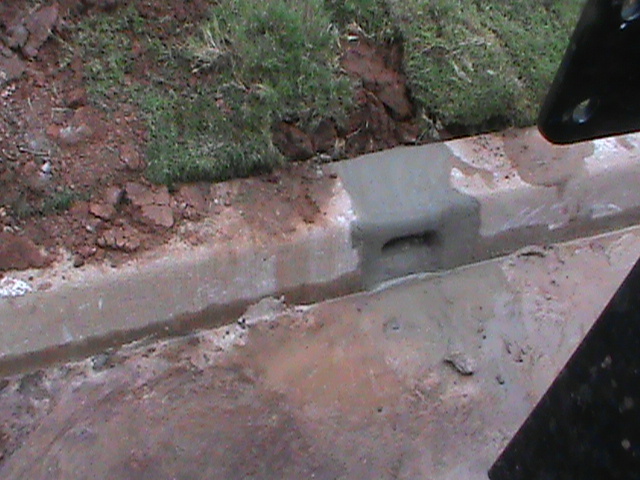 A Curb Fitting is installed through the curb and requires Wet Cement to install it. When I talk to a potential customer while doing a Drainage System estimate, I take a lot of things into consideration. First I have the Customer show me where water is standing or where it is going that it shouldn’t. This is part of defining the specific problem area. Sometimes the Water Problem Area is larger and more involved than the customer realizes. Once the Water Problem Area is clearly defined, the next step is to determine how the water is getting to the problem area. Many times there is more than one Water Source to the Water Problem area. A big mistake in Drainage System Design is to stop once the most obvious Water Source is found. A Drainage System Designer must be a detective to some degree. For Example: Water running down the hill and onto the back patio might be the most obvious water source. Sub-surface water or a neighbor’s new gutter downspout could also be contributing. Most of the time water gets into the problem area from more than one source. Next you must decide where to take the water. This is determining an Exit Point for the Drainage System. If possible you want your exit point to be down hill from the problem area. If it is up hill in all directions from the problem area, then the only solution is a Sump Pump. Once an exit Point is determined, you must ask yourself if there is any way to install two exit points. Usually this can only work when an exit point can work on both ends of a Drainage System. The benefit of two Exit Points in a Drainage System is it greatly increases the water capacity for the Drainage System. It can move much more water faster during a heavy rain than a system with just one Exit Point. Most Drainage Systems can only utilize one Exit Point. In 21 years of Drainage System Installation, I would say 10% of our Drainage Systems have two Exit Points. Next we have to decide what type of drain to install in the problem area. If it is a small area with one water source, Usually a Surface Drain is best. If the water problem area is large with one or several water sources, a French Drain is usually installed. If you have several problem drainage areas you must use larger Drain Pipe if you want to connect them together to one exit point. Large French Drains should have their own exit point without attaching other Surface Drains or Gutters to them. 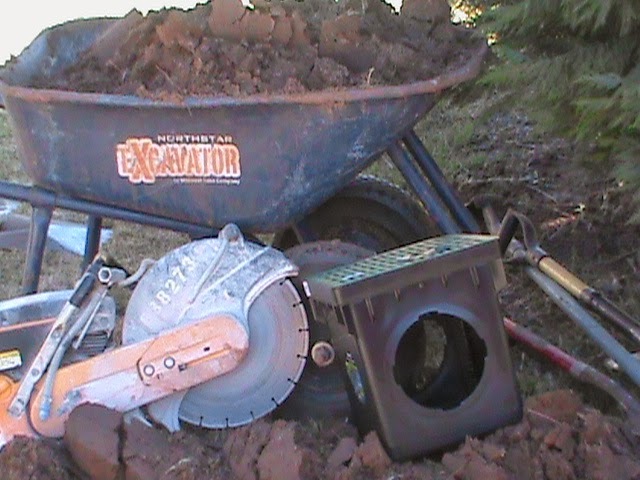 It is very common to connect too many drains or gutters into a Drainage System. A hard rain can overwhelm the Drainage Systems Water Flow Capacity. When that happens, water backs up and the problem area floods. I just shake my head when I see 3 French Drains and 5 gutters connected into one exit drain pipe. I see this type of design all the time. Why spend money for a Drainage System that won’t work? Lots of Cheap Builders and Fly-By-Night Drainage Companies cut corners on Drainage Systems and French Drains on new home construction. For a French Drain or a Surface Drain or any type of Drainage System, If in doubt, use a larger Drain Pipe. Four Inch Drain Pipe is the most common. Six inch Drain Pipe is always better. If you are going to connect a French Drain and Surface Drain together, use 6 inch Drain Pipe. Installing a French Drain by itself or as part of a Drainage System is a very fulfilling aspect of my job as owner of CMG Sprinklers and Drains. Many times Drainage Problems have caused damage to homes or businesses. Understandably the owners are stressed an unhappy. Over the years French Drain installation has solved a broad range of problems caused by “Standing Water.” French Drains have removed water from home foundations and stopped further water damage. French Drains have protected and enhanced driveways and sidewalks. French Drain Installation has also removed Standing Water from flowerbeds and yards that weren’t level. Once we even solved a water flow problem where a customer in Chickasha had water tear off their garage door and take out the back wall of the garage. A Double 6 inch French Drain across the hillside above the driveway solved the problem. Providing piece of mind and safety to property is satisfying. French Drain Installation Provides this! 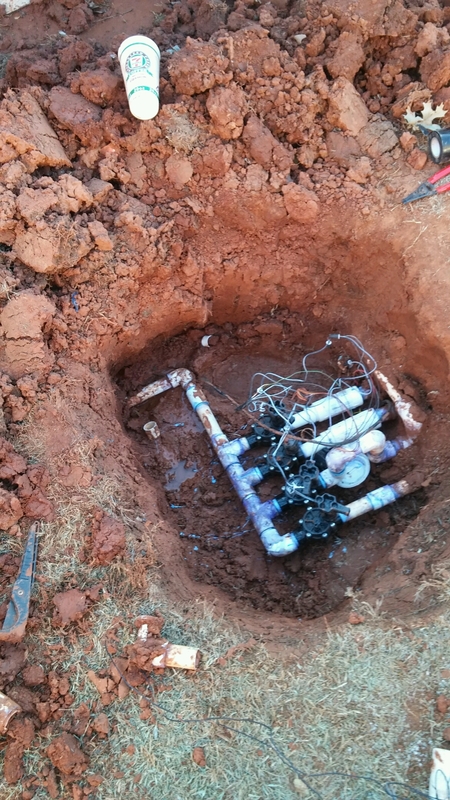 CMG Sprinklers and Drains also installs new Sprinkler Systems and provides expert Sprinkler Repair. Many times Sprinkler System Installation is a luxury where as French Drain Installation is a necessity! 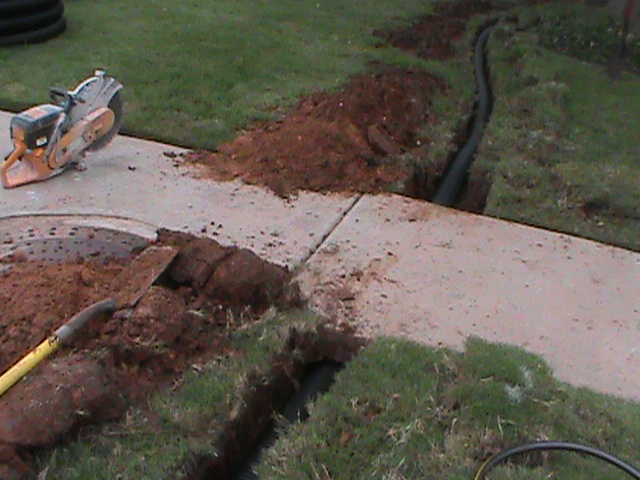 Today we installed a small four-inch French Drain in Oak Ridge Village Apartments in Midwest City. Water was moving down the hill and hitting the wall of a downstairs unit. Water penetrated the wall and flooded the unit each time it rained. CMG installed a 4 inch French Drain along the wall in front of the Apartment. Once the French Drain was installed, 4 inch solid Drain Pipe was connected to the down hill end of the French Drain. From there we ran the Solid Drain Pipe 20 feet to a Pop-Up Emitter on the sidewalk. Drainage Problem solved by a 4 inch French Drain. 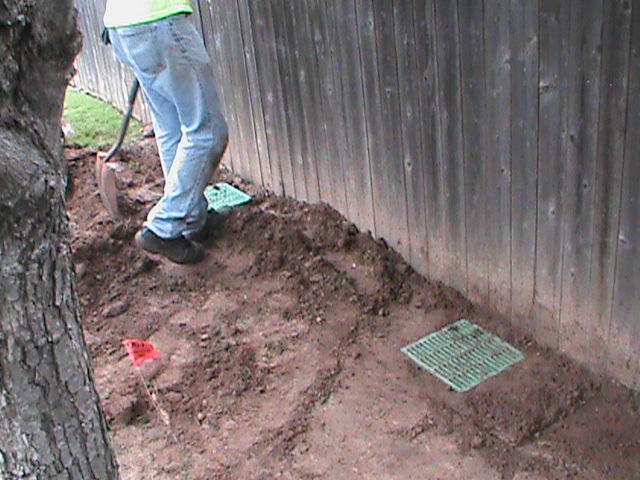 French Drains are a great way to keep water from getting under walls or into foundations. CMG Services Yukon, Oklahoma City, Norman, Edmond, Mustang, Moore, Midwest City and all surrounding areas.